Whenever I ask Dave what he wants for dinner, he invariably says, “Chocolate Chili,” and when I reply that we just had Chocolate Chili last week (or last night), his second pick is always West African Chicken Stew from Well Fed 2. This is one of our favorite, go-to recipes, and I was surprised to realize I haven’t shared it with you here yet. Confession: I have a thing for peanut butter. Where “thing” is that I love it to distraction. I especially adore peanut butter in unexpected places, like soups and savory dishes. It was a heart-breaking day when I learned that peanuts are a legume and, therefore, maybe do not love me back. 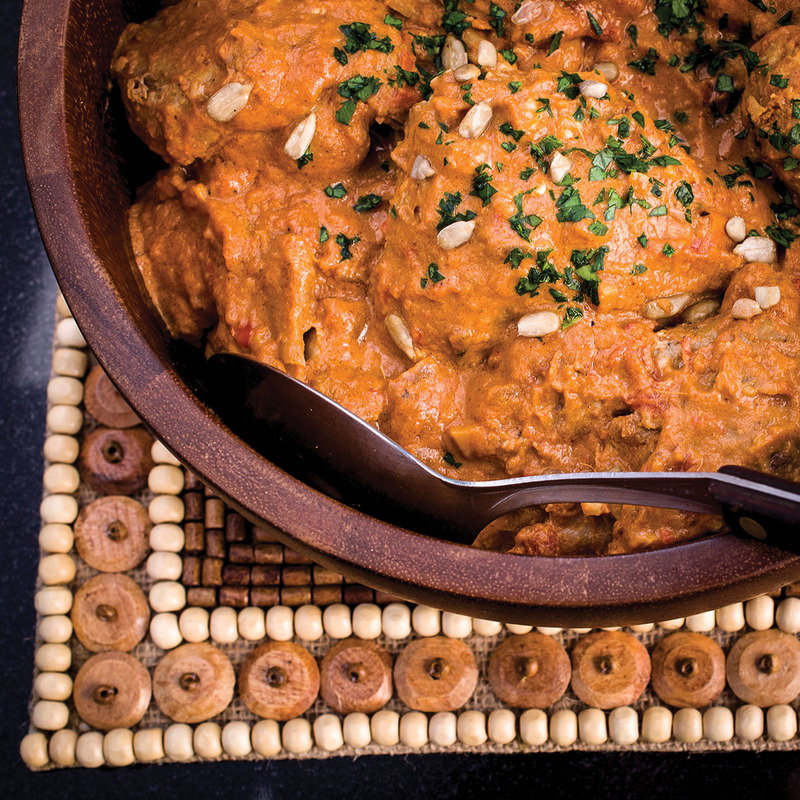 But sunflower seed butter is an excellent rebound partner, and this stew—traditionally made with peanuts or “ground nuts”—will win you over with its savory combination of creamy sunflower seed butter, just the right bite of heat (from the ginger and cayenne), and the underlying sweetness of vanilla and coriander. Sprinkle the chicken with the salt and pepper. Heat a large soup pot over medium-high heat, about 3 minutes. Add the coconut oil and allow it to melt. Add the chicken in a single layer and brown well on both sides, about 10 minutes. (Don’t crowd the pan; cook in batches if you need to.) Remove the chicken to a bowl to catch the juices. In the same pot, cook the onions and ginger until soft, about 5-7 minutes. Add the garlic, coriander, cayenne, and bay leaf, and cook until fragrant, about 30 seconds. Add the tomatoes and water, stirring to combine. Nestle the chicken into the sauce, along with any juices it released. Increase the heat to bring the pot to a boil, then reduce to a simmer and cook, covered, for 25 minutes. Remove the chicken from the pot; it will be very tender. Break the chicken into large pieces with the side of a wooden spoon. Add the sunflower seed butter and vanilla to the pot and mix to combine. Return the chicken to the pot and cover. Heat through, about 5 minutes, then serve, sprinkled with parsley and sunflower seeds. Replace the chicken with white fish: Skip the browning step and jump right to making the tomato sauce. Poach the fish (cod, haddock, sea bass) in the sauce for 6 minutes. Remove the fish, add sunflower seed butter and vanilla to pan and heat through. To serve, spoon the sauce over the fish. Oh yum! I make a stew like this inspired by how I learnt to cook it whilst I was living in West Africa so I can vouch that this is pretty authentic! I make a paste with fresh tomatoes, onions red chillies, ginger and garlic, now I use a food processor but in Ghana a ridged terracotta bowl is used with a wooden pestle to grind with (I still have mine but it is a pain to clean!). I sub almond and coconut butter for the peanut butter which gives a great flavour. Mmm, I’m going to have to make this soon! Thanks for sharing. I like the idea and I think it will taste divine (I also have a p-butter thing) but is there a way to make it look less like pudding? I just made this on Sunday for my parents – it was INCREDIBLE. So, so awesome. Served over cauliflower rice with some roasted plantains and zucchini on the side. Thank you so much for sharing these recipes – do you ever sell signed copies of your books? Thanks! Hopefully your new digs are treating you well. I’m hoping you continue to bestow new recipes on us every once in awhile – I’m really loving everything I’ve tried. My one true regret is that I didn’t discover you sooner! I made this stew a few weeks ago–it was superb. (As a matter of fact, maybe I should make some this weekend … ) Oh, and I had some preserved lemon, which went really well with it. Long overdue kudos to you, Mel–I have both Well Fed and Well Fed 2. They are my food bibles. When I’m getting a little bored, and questionable eating habits are creeping in, a Well Fed recipe is just the thing to fix me up and get me excited about dinner again! Such a great idea to add the preserved lemon! I’m really glad the recipes in the cookbooks help you fight boredom! Happy cooking to you! I doubled this recipe (except the cayenne & vanilla) and made it the instant pot. Delicious, served with steam sauteed red cabbage. It does freeze well! After you defrost (in the fridge) reheat it slowly covered, then simmer uncovered for a few minutes. Should be great! Goodness gracious, this was so delicious! It is going into the rotation immediately! We didn’t even eat it over anything… just plain. I’m definitely doubling next time. Try it for breakfast! It’s great the next day. This recipe is SUPER flexible. Glad you tried it with breasts—also works great with pork or beef, too. I’ve been a follower of yours for years, and have not ONCE been disappointed in a recipe you’ve shared! This was so delicious. I substituted jalapeno spiced canned tomatoes and left out the cayenne – the perfect amount of kick. Thank you, thank you! This is one of our personal favorites, too! Glad you enjoyed it! Great idea to use the tomatoes with jalapeño! I made this for my three picky boys and my pickier mother in law. Everyone loved it! I added a head of cauliflower (cut into florets) 15 minutes into the simmering phase to make it a one pot meal (and because I’m lazy). Thank you!! YAY! I’m glad it was a hit! I’ve enjoyed this recipe for so long, it’s high time I left a comment expressing my appreciation! I’ve made this with peanut butter (I know, I know) and almond butter, and the almond version is equally delicious in the opinion of this peanut devotee. I sometimes throw in a chopped sweet potato to make this more of a “meal.” However, this recipe is divine as written, and I love that it tastes even better the next day. Thank you so much! Wow. I just found your site from a guest post on Nomnompaleo.com and I am so excited! I co ok ked this recipe because I had everything on hand including defrosted chicken thighs. I’m not a fan of almond butter so I’m always looking for ways to use up my large jar. Did.Not.Disappoint! Creamy and full of flavor layers. I used my instant pot as someone suggested and 10 minutes was perfect! No preserved lemon but I had some Japanese pickles that gave it a nice tang to cut through and offset the heaviness of the almond butter. Such a winner! Off to buy your cookbooks!! I’m so glad you found me and tried this recipe! Thank you for taking the time to comment and say hi!